A good mix of abilities across the range, if not truly outstanding. Bass is particularly good, while midrange is clear and detailed. 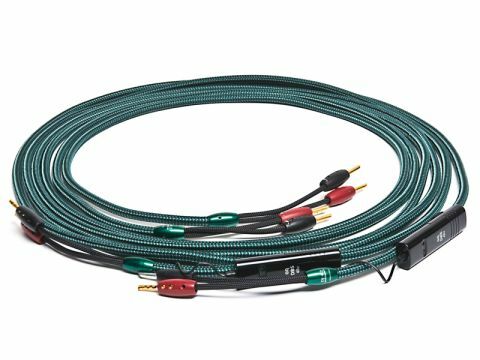 One of the vintage names in audio cables, AudioQuest has remained true over the years to certain design principles while still managing to innovate. The CV-4 illustrates both of those approaches, featuring as it does AQ's familiar 'Perfect Surface Copper' solid-core conductors alongside the relatively new 'Dielectric-Bias System'. This is a rather interesting idea, which uses a small battery (housed in a plastic moulding which clips to the side of the cable) to provide a 48-volt bias to the insulation within the cable, effectively stressing it uni-directionally before any audio signal is applied. The aim is to reduce 'energy storage' in the insulation, though no-one has ever demonstrated that to be a problem: nor is it obvious that the DBS would reduce its effects. Come to that, the claims AudioQuest makes for the existence of distortion in normal cables are not well supported by scientific evidence. Anyway, the star-quad geometry with four mixed-diameter cables and the low-to moderate resistance, will do no harm at all to an audio signal. Indeed, we found the sound of this cable to be perfectly acceptable, if not entirely groundbreaking in the way AQ's publicity might lead one to hope for. It seems to have a nice solid bass with plenty of rhythmic impact, but also a pleasingly tuneful quality, and this makes for sound which grabs the attention and holds it well too. Such limitations as there are show up in the treble, which can sound a little dry at times. Nevertheless there is good detail and nice stable stereo imaging across the frequency range.